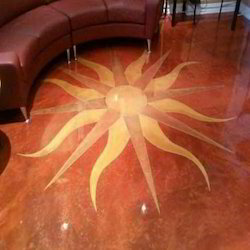 Clients can avail from us a wide range of Epoxy Floorings. Under this range, we include Two Component Primer Based Epoxy Flooring, Three Component Pigmented Self Levelling Epoxy Flooring, Self Levelling Anti Static Epoxy Flooring and Self Levelling Transparent Screed Epoxy Flooring. These products are well appreciated by the clients for their features like perfect finishing, high tensile strength and smooth texture. 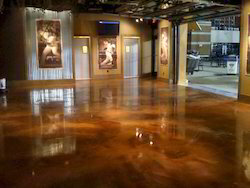 We are providing Self Levelling Anti Static Epoxy Flooring Service. 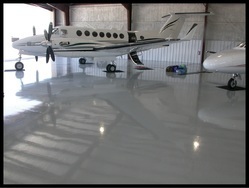 We are providing Two Component Acid Resistant Epoxy Flooring Service. 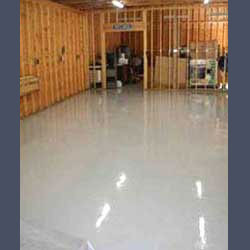 Our esteemed customers can avail from us a wide and exclusive assortment of Two Component Primer Based Epoxy Flooring. Owing to their features like hard wearing, non dusting, excellent surface finish, non smelling and good aesthetics, these products are widely appreciated by the clients. Further, customers can avail these products as per their need and requirement. 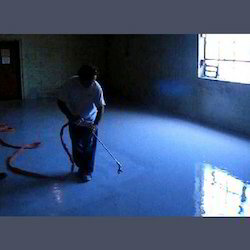 Penetrates into pores and gives excellent bonding with subsequent epoxy flooring and coatings. Consumption will vary depending on surface porosity. Our client can availed wide range of Two Component Acid Resistant Epoxy Flooring which are made up of Shali Poxy AR is a two component, room temperature cured, 100% solid epoxy system designed to protect surface against severe chemical attack. Shali Grout 50 is formulated to provide consistency and exacting performance in critical grouting operations. We are offering a wide range of Three Component Pigmented Self Levelling Epoxy Flooring to our valuable clients. Our offered range provides monolithic, smooth, non-porous, hygienic, chemical resistant and easy to clean and maintain floor. These range are available in a number of colors and has sufficient strength to withstand industrial traffic with nylon and rubber wheels. 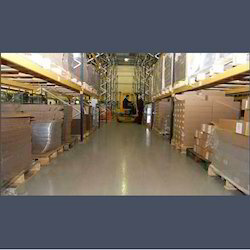 We are well known supplier and trader offering an extensive range of Self LevelingAnti Static Epoxy Flooring. Our range are a multi-layer system comprising of shaliprime AS, shali screed SL AS both base coat and top coat. These systems gives a thickness of 3 5 mm with anti-static properties. 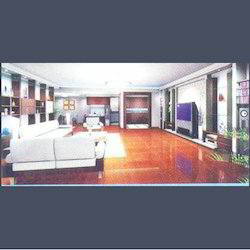 Shali screed SL AS top coat 100 gms / rm 250 gms / sq. Our organization is amongst distinguished suppliers and traders of high grade Self Levelling Transparent Screed Epoxy Flooring. These products are offered with graded multi-colored aggregates for use where higher strength and toughness is needed apart from the leveled surface. Our range has an excellent adhesion and provides good abrasion resistance on floors with heavy duty traffic, which is applied in thickness from 3 mm to 5 mm. Shali Urethane TC (formerly known as Shaliol PU) is two component, liquid aliphatic polyurethane based UV and weather resistant coating. It is ideal protective coating for exposed surfaces as it provides excellent weather resistance and light stability. Shali Urethane TC films are hard, tough but flexible and display good solvent and gasoline resistance. Shali Urethane TC is available in various colours. Shali Poxy WB is a two component, solvent-less, water based, low odour, poly-amine modified epoxy coating. It acts as a tough abrasion resistant coating that withstands wear and chemical attack in a variety of applications. ShaliPoxy WB should be used in many areas where a solvent based product is not permitted. ShaliPoxy WB comes in a variety of colours with matt finish. Shali Poxy WC LB is a solvent based coating for vertical application on walls. The cured surface is hard and gives smooth finish. It is joint-less and hence will not support bacterial growth. It resists abrasion and can easily be cleaned. 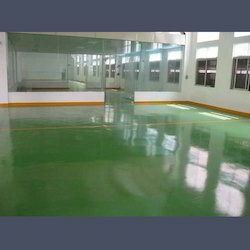 Offering wide range of Solvent Free Epoxy Flooring which are made up of Shali Poxy AR is a two component, room temperature cured, 100% solid epoxy system designed to protect surface against severe chemical attack.This also can be used as a repair product in various types of application in projects. 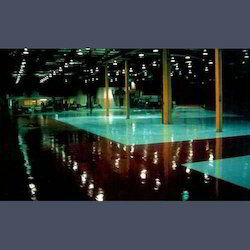 Shali Poxy FC is high build Epoxy floor coating with high resistance to abrasion and provides dust free floor surface. The cured surface is hard and gives smooth finish. 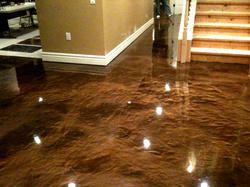 Shali Poxy FC provides joint-ness, monolithic, smooth, non-porous, hygienic floor, which is easy to clean and maintain. It has excellent resistance to abrasion. It cures to give a semi gloss finish. Shali Poxy FC is approved by CFTRI.